The American Civil War has proven a fruitful topic for many filmmakers over the year, and ‘Free State of Jones’ is another film with a fascinating story to tell. The issue here is that Gary Ross doesn’t know where his focus should lie, and a potentially brilliant film turns into something meandering and scattershot. The film’s main story focuses on Newton Knight, a medic in the confederate army who deserts his duty after one of his young relatives dies in action. Upon returning to his home in Jones County, Mississippi, Newton becomes more and more jaded with the confederacy, eventually leading to him fleeing to a swamp where several runaway slaves are hiding out. Over time, many more deserters find their way to the swamp and Newton organises them, alongside the slaves, into a military unit who take up armed rebellion against the confederacy and end up taking control of large parts of South East Mississippi. 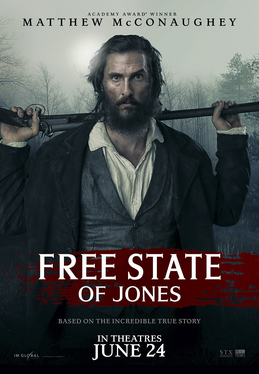 If the film focused squarely on this story, ‘Free State of Jones’ could have been a terrific and powerful movie, but the decision to jump from theme to theme and the lack of focus really starts to hurt the narrative flow of the film. At times, the film plays too much like a history lesson with the film regularly keeping the viewer updated with how the rest of the civil war was panning out, and I’m not sure this wider context was really required. In addition to this, there are several bizarre detours to a subplot 80 years later with one of Newton’s descendants that is connected to the main plot in the loosest sense possible, and it belies a lack of trust in the main story to keep audiences engaged. There’s a really compelling story in this material but every time we move away from the central story the film loses direction and purpose and these are issues that should really have been sorted out in the editing suite. ‘Free State of Jones’ does have several things going for it, namely a suitably dedicated and grizzled performance from Matthew McConaughey, who looks right at home in the period setting. He’s at the front and centre of just about every scene and he is incredibly convincing – this is a man who unites a combination of runaway slaves and confederate deserters into a tough military unit and it never feels unbelievable. Beyond McConaughey, ‘Free State of Jones’ never spends enough time with any of the other key players to really make us care, and the lack of character development does start to hurt the narrative when it tries to shift focus to Moses (Mahershala Ali) towards the end. For the woman in Newton’s life, Gugu Mbatha-Raw and Keri Russell were cast, but both of these talented actresses are largely wasted in roles with little to do beyond service Newton’s story. ‘Free State of Jones’ is an enjoyable movie but it also feels like a missed opportunity to deliver a truly great movie.